Whenever I get a new Cooking Light magazine, I tear out a bunch of recipes that look good. Then, I hand the stack to Jason and ask him to pick his four or five favorites so I can shop for ingredients and make the selected dishes for that week’s meals. This month, this recipe was the first one chosen, so I decided to tackle it first as well. The verdict? These are some tasty sandwiches. The chicken marinade gives the meat some heat, and the crunchy tortilla chip coating is a nice change from the usual breadcrumbs. The cilantro lime mayo has both a nice Southwestern kick and a great acidic finish, making it seem lighter than your average spread. I thought about adding some sliced tomato to the list of toppings, but 1) tomatoes are not looking so yummy right now, and 2) the lettuce and onion were just enough to add some zing and crunch without overpowering the flavor or texture of the rest of the sandwich. 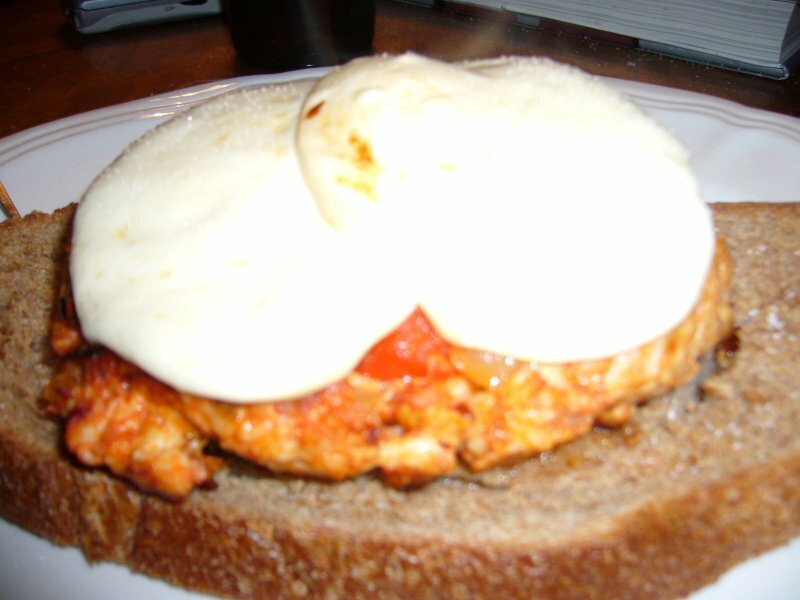 This is a great, quick, easy weeknight meal, and the leftover sandwiches were actually very good served cold the next day. Of course, you could always prepare the corn-crusted chicken and use it in other dishes (tacos immediately come to mind as something that would work well). Enjoy! After reading this month’s Bon Apetit, Food & Wine, Cooking Light, and Real Simple magazines, I had torn out about 20 recipes that I really wanted to try. Since I couldn’t decide which one would be first in line, I asked my boyfriend (a.k.a., my guinea pig) to pick Saturday night’s experimental meal. 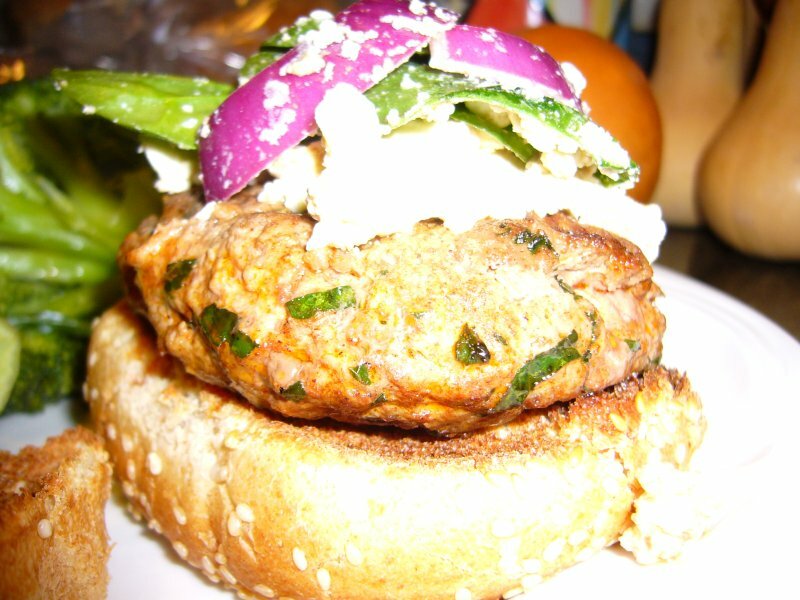 He opted for these delicious lamb burgers, and they really turned out well. The combination of the cinnamon and paprika gave the meat a nice smoky tinge, and the mint chimed in at the end of each bite to add a little refreshing kick. The spinach, onion, and feta salad was the perfect accompaniment, and you could easily serve it on the side if you didn’t prefer to top the burgers with it. Jason really liked the texture of the lamb and found it to be a nice change of pace from the usual beef burger. Enjoy! Mix first 4 ingredients and 1 1/2 tablespoons oil in medium bowl; mix in lamb. Shape into four 3/4-inch thick patties. Cook patties in large nonstick skillet (I used a grill pan) over medium-high heat. Note: the recipe says 4 minute per side for medium, but I cooked mine 5 minutes per side, and I still got rare to medium rare. Granted, that’s what I was going for, but I just thought I’d let you know to go with your own timing if you don’t like your lamb baaaa-ing at you like I do. Meanwhile, preheat broiler. Broil buns until golden, about 2 minutes. Top each bun bottom with burger. 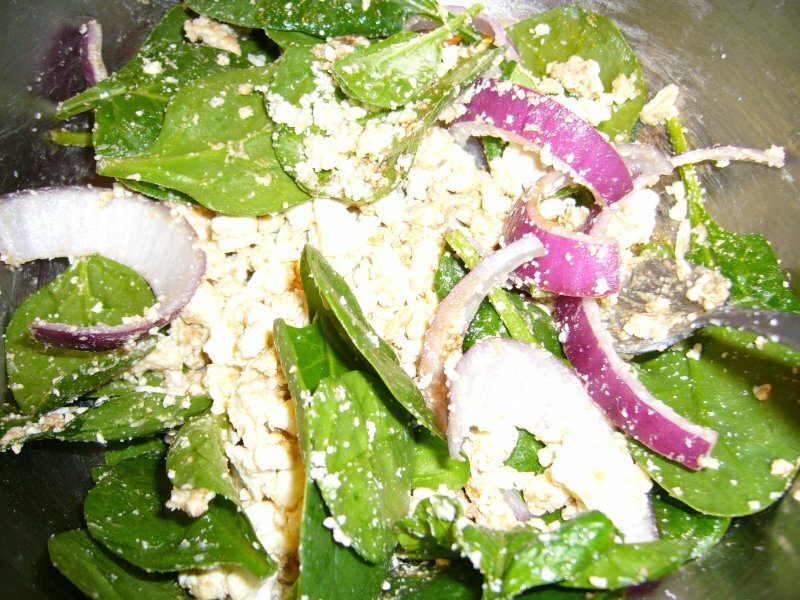 Toss spinach, feta, onion, vinegar, and 1 1/2 tablespoons oil in bowl. Place salad atop burgers. Cover with bun tops, pressing firmly to compact. This is another Rachael Ray recipe, though I modified it significantly due to my boyfriend’s intense hatred of mushrooms. The burgers were pretty thick, so I had to cook them longer on the grill pan AND finish them in the oven (even before I put them in the oven to melt the mozzarella). However, they were spicy and moist, and they tasted great with the portobello (I can’t vouch for how the wheat bread bun tasted, but Jason’s plate was empty, so I think it turned out alright). The smoked mozzarella was out of this world–I don’t think the burgers would have been as satisfying with regular mozzarella, but you could certainly go that route based on your tastes and your on-hand ingredients. Preheat oven to 450 degrees. Heat a large nonstick skillet over medium-high heat. Combine meat with salt and pepper, chopped bell pepper, chopped onion, garlic, tomato paste, Worcestershire, crushed red pepper flakes, and cheese. Score and form meat into 4 large patties, 1 inch thick. 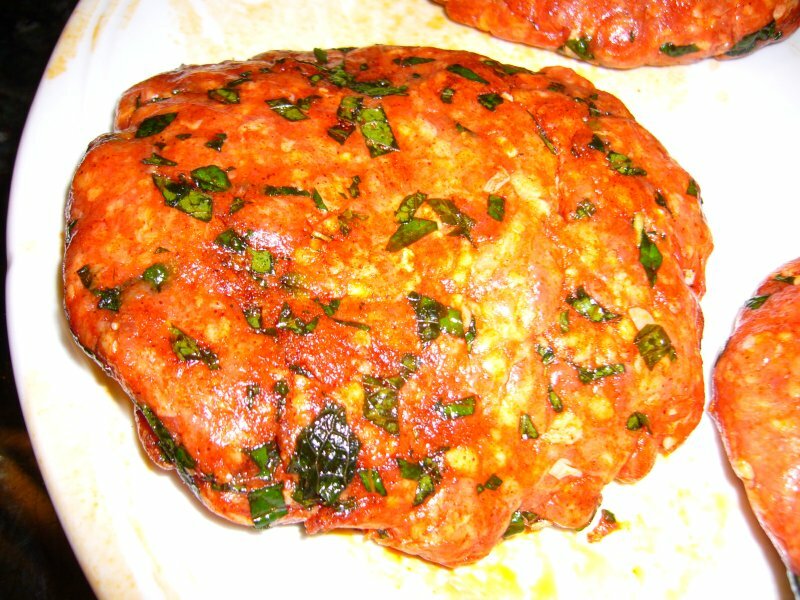 Drizzle extra-virgin olive oil on top the patties then fry 5 or 6 minutes on each side in a hot skillet. Place portobello caps on a small baking sheet gill side up and drizzle extra-virgin olive oil on them. Roast the caps 12 minutes. Remove them from the oven and season them with salt and pepper. Turn oven off. 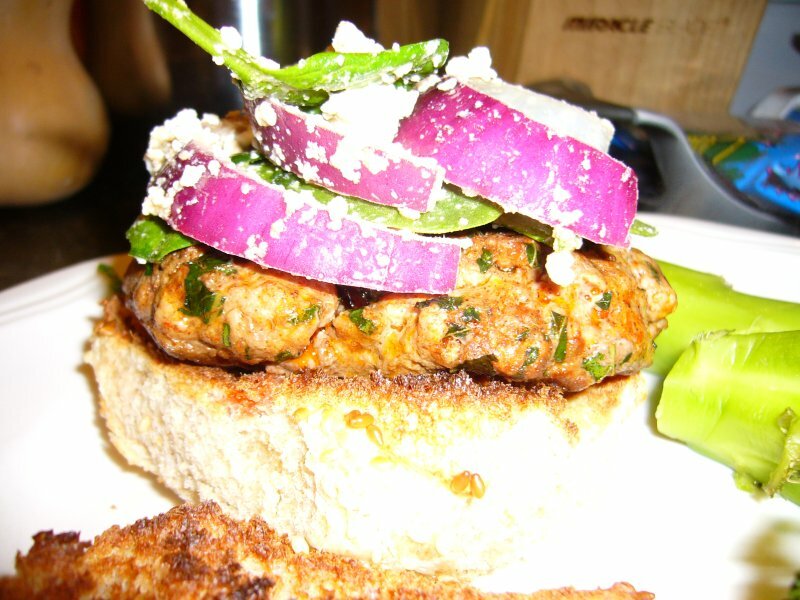 Top each burger with mozzarella and place back in still-warm oven. Melt the cheese 1 minute. Transfer burgers on “bun” bottoms to plates. The picture doesn’t really do the burgers justice–they were pretty damn good.